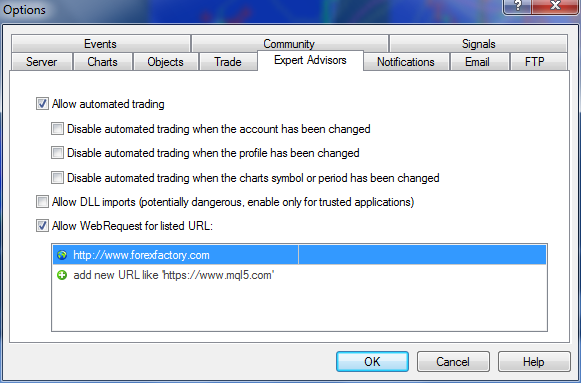 As I'm currently developing an Expert Advisor for Crude Oil and Brent, I wanted to get from ForexFactory.com the exact date and time of the 'Crude Oil Inventory' report. This report is typically issued on Wednesday's at 10:30am Eastern but when there's a holiday, the release date can change. As this is an important report for my EA, the only way was to check an online service to validate the release date. Next is to define a structure in your code to store the events. This is placed somewhere at the top of your code which will declare 'DailyEvents' as a global variable with a maximum number of stored event defined by the 'MaxDailyEvents' variable. #define     MaxDailyEvents       20    // If you think you'll have more than 20 High Impact events, increase this number. We first need to build the URL for the WebRequest. As I only wanted their calendar for the day and not the default (all week), we can do so by setting the 'day' parameter of the request to today's date and sending the request. Then we send the request, check the error code (if any) and convert the returned character array to a string. This makes it easier to parse the HTML code. If there's no error, we then convert the character array 'result' to an string for better parsing. Now that we have a string, we can use the 'StringFind' function to locate HTML elements. The first thing is to make sure the returned HTML is indeed for today's date and cut anything before this HTML tag. The function 'GetHTMLElement' is used to parse the HTML code and return the value between the HTML tags specified. See below for it's definition. Definition of the 'GetHTMLElement' function. Ok, now that we've made sure the calendar returned is for today's date, let's start parsing each of the table row and extract the elements we need. Namely event time, event currency, event impact and event title. We need to do this for each table row there is in the HTML code until the end of the calendar or the MaxDailyEvents has been reached. Once the data for each row has been extracted, we add it to the DailyEvents structure. // Is this a high impact event? Once we have parsed all table rows and reached the end of the calendar, we need to display the events on the chart. If the event is in the future, I want a vertical line displayed and if in the past, no line. If the events that are on the future, I want to notify the user of an upcoming in event if it's within 5 minutes of the current time and remove the vertical line. This is done by adding some code in your 'start()' function of the EA or indicator. // Is there a high impact event in the next 5 minutes? And finally, we need to get the daily events. This is done by adding a line in your OnInit() function.